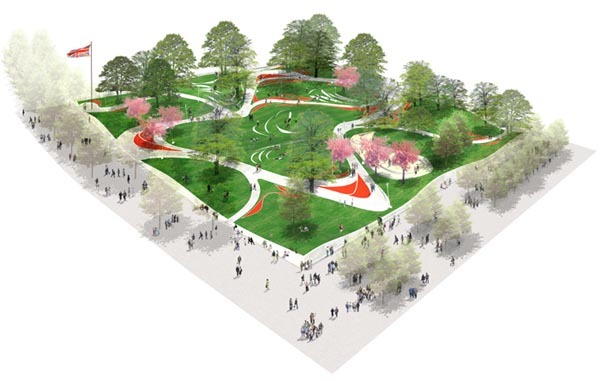 West 8 is announced as the winning design team picked to turn the hotly debated Jubilee Gardens in central London into a world-class park. The four-way contest saw West 8 selected ahead of EDAW, Gross Max and Thomas Heatherwick. West 8's design concept focuses heavily on developing an organic, lush and green park, with softly undulating hills. The sophisticated topography creates paths which are fluid and inviting, prime lookout points which frame dramatic, panoramic views of the Thames, the London skyline and the South Bank, and intimate spaces where people can find their own space to relax and enjoy the micro-climate. At night, a theatrical spectacle of light will subtly animate and play with the new weaving landscape.